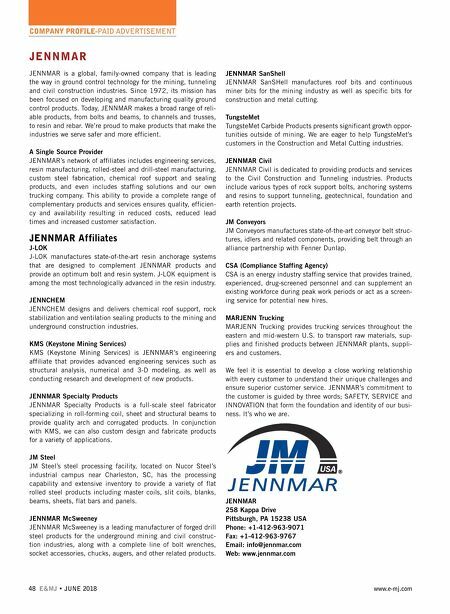 G L O B A L H E A D Q U A R T E R S Pittsburgh, PA USA • (412) 963-9071 • www.jennmar.com IMPROVED PRODUCTIVITY, SAFETY, AND RELIABILITY J-LOK P ADVANTAGES 1. Signifi cantly decreases bolting cycle time 2. Provides true, long-term, single pass, ground support in poor or collapsing drill hole conditions 3. Decreases stope access downtime for increased ore production 4. Immediate tension can be applied 5. Customizable and reliable set times from seconds to hours 6. 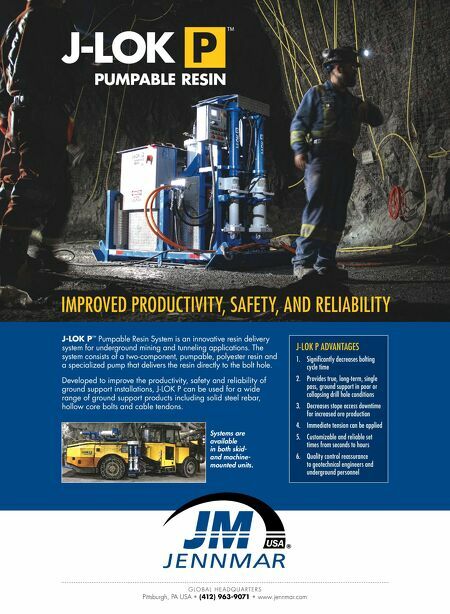 Quality control reassurance to geotechnical engineers and underground personnel J-LOK P ™ Pumpable Resin System is an innovative resin delivery system for underground mining and tunneling applications. The system consists of a two-component, pumpable, polyester resin and a specialized pump that delivers the resin directly to the bolt hole. Developed to improve the productivity, safety and reliability of ground support installations, J-LOK P can be used for a wide range of ground support products including solid steel rebar, hollow core bolts and cable tendons. Systems are available in both skid- and machine- mounted units.